Yes, definitely a food for thought book. First of all, I appreciated the author's reason for writing this book, to promote understanding between the two currently conflicting religions. I also liked the situation Mr. Licona set up to make this debate seem real.A few observations: the topic was very limited, and so the 2 men, Paul and Muhammad, could not fully answer questions that did not have to do exactly with the topic. Otherwise they were very interesting questions. Which I would have liked to hear their answers to...Second, Mr. Licona chose Paul to take on the harder position, proving that something is, and not what something is not. Which seemed like a quirky thing to do, especially since he admits to being Christian in the beginning of the book. Third, Muhammad's argument, overall, did not have any impact on me at all because his whole basis was on the Koran, which I don't believe in the first place. Fourth, Muhammad used minimal logic. His appeal was very emotional. Once again, I was not affected.Fifth, Paul's arguments suited my personality very much. But I also think his argument would have been much more convincing to others as well. I only wish he would repeat his ideas using different phrases. I must have heard the same exact phrase 10 times in the book! It was rather annoying. Sixth, I enjoyed the presence of the moderator. It served to make the book seem real. 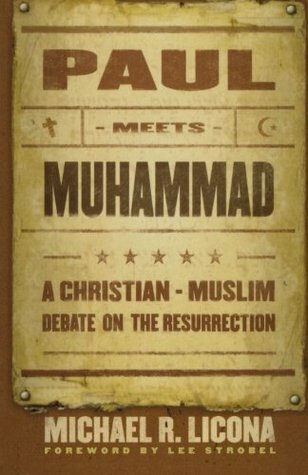 I also liked the side story Mr. Licona put in, to give us a break from thinking, to open and close the sections, and give the book a setting.Lastly, I would like to see another book come out and make it so that Muhammad has to take on the harder side and see how his argument would change. Would he rely on the Koran as much?Overall, an enjoyable book, but not if you're not in the mood to think too much. Debates on resurrection had spark controversy in the West after Ahmed Deedat, a famous Islamic preacher in 1970s-1980s had claimed he defeated few Christians scholars and pastors using his "swoon theory" and "cruci-fiction theory" to defend Quranic case against the resurrection. Despite that, the burden of proof lies on the Christians much more rather than Islam. Until Dr Gary Hebermas collected thousands of scholarly work on the case for resurrection back in 1980s and make case strong to defend the resurrection using various method apart from the Gospel narrations.In this book, you will found both. Despite the fictitious between apostle Paul and prophet Muhammad emphasised here, the content that on the subject matters were indeed facts from both sides. It is the matter which facts able to defend itself and how convincing it is.My personal bias imply that Paul win this debate because of the extra-biblical facts presented. Unfortunately, the subject matter on the Resurrection rely more on biblical sources. Thus, it is appeared that Paul unable to defend the reliability of his writing in 1 Corinthians 15 and 4 sources of Gospels due to limited space in this debate.On the side of Muhammad, the argument for the Quran is very weak. Plus, it also didn't rely more on his saying in hadiths and sirah narrations. Constant attacking on Paul arguments rather than defending the Quran does not made Muhammad the winner of this debate. Despite of that, Muhammad really good at rebuttal against Paul. As to be honest, with current scholarship of sceptics against the case of Resurrection, Muhammad can improve much better his arguments.So, up to the reader to decide. An interesting read, with some good information on the issues of debate between the sides. However, Mike Licoma's "mere Christianity" really comes through in here. While the writing is enjoyable and the line of arguement seems fair, a reader who holds to a higher view of Scripture than Licona will be disappointed. His constant refusal to dig into, or even really support generally, the idea that the Scriptures are truth and reliable sticks out sorely. I would look to much better apologetic methodologies to equip myself and others for debate and for other resources to share with a Muslim to present the case for the Christian faith. This is simply not strong enough to accomplish those tasks in my view. Sometime in the near future . . .What would it be like if Paul and Muhammad could dialogue with one another in a public debate on the resurrection of Jesus? Sometime in the near future, computer software is developed that allows for all the writings of each of these men to create "quasi-artificial" for each one of them so that they can debate each other. I didn't find anything new or unexpected in this book, but the author's style is engaging. He presents topics in an interesting manner so that the reader can get an overview of the key differences between the biblical and Muslim view of the death and resurrection of Jesus. The author admits his Christian bias, and that bias is evident in the book. I did, however, believe that the Muslim side was presented intelligently and fairly. I'd recommend this book to anyone who is interested in trying to understand how Muslims look at the resurrection of Jesus and especially to Christians who are interested in trying to share their faith with Muslims. The book is written from a very creative approach. I liked and disliked that the book is filled with so many facts; at some points the book can seem a bit repetitive and the information can get a little overwhelming for the casual reader. So this book is great as a reference book. If you like facts after facts on either side of the argument, this is the book for you. I also liked that the author does not choose a side, rather he presents all the facts that either side would present and leaves the decision up to the reader. Great book to help you decide on which side of the argument you are on. One note: Its important to look at the facts from history to make a conclusion. Its not a good argument to say. "I believe what I believe because this book tells me so and that's good enough for me." Historical Evidence is the strongest evidence. Licona did a wonderful job of presenting a balanced argument between the Apostle Paul and Muhammad. Sometimes it's worrisome that an author wouldn't give a fair shake to the opposing worldview in these types of books but Licona was definitely fair when writing the Islamic dialogue. He presented very advanced criticisms of the resurrection from the Islamic point of view. I highly respect Licona as a Christian scholar and a fellow brother in Christ. His understanding of the texts is nothing short of amazing.It was a very entertaining read and added a depth to my understanding of Islam as it pertains to their rejection of the resurrection. I highly recommend it! It was an excellent book. The idea of bringing a fiction of MIT machine that could think like the person and having the debate in a very constructive way was interesting. I would hope that Christians and Muslims would engage in this type of positive and constructive debate. If a sequel to this book would be written, I would like to hear the Muslim build a case for their faith and the Christian arguing against. A brilliant work of high-concept apologetics that delivers far more than its provocative premise suggests. Dr. Licona one of the finest resurrection scholars alive, and this work is by far one of the best I've read on the subject. He argues the Muslim positions far better than any Muslim apologist I've read! I thought this book was a great read. It helped me see where the Christian and Muslim views differ, especially in relation to the death of Jesus and his resurrection. I would recommend this book to anyone trying to figure out the differences between Christianity and Islam. If you like debates or want to talk to Muslims about Jesus' divinity, this is a great book! Interesting read. Although burly at times, and fictional, one must assume that it is based in fact. It's most certainly given me food for thought, and a desire to study further. Based on Mike's real life experience. Michael R. Licona - Born in Baltimore, Maryland in 1961, Mike became a Christian at the age of 10 and grew up in a Christian home. He attended Liberty University where he earned his Bachelor’s Degree in Music Performance (Saxophone). During his undergraduate studies, he had a strong desire to know God, devoting himself to studying the Bible daily. He decided to learn Koine Greek in order to read the New Testament in its original language and later completed a Master’s Degree in Religious Studies.Toward the end of his graduate work in 1985, Mike began to question the veracity of his faith and wondered if there was any evidence to support it. He decided not to go into Christian ministry at that time. Finding answers to his questions consumed him and he almost jettisoned his faith. He investigated the evidence for Christianity and a number of other major world religions. He also considered the arguments for atheism. His investigation solidified his belief that God exists and that he has actually revealed himself to mankind in Jesus Christ and that the Christian view provides the most plausible and unified theory of reality.In July of 1997, Mike formed TruthQuest Ministries in order to give an official name to his growing ministry and to allow future donors to make tax-deductible gifts. In October 2001, the ministry was renamed “RisenJesus” in order to avoid confusion with other ministries named “TruthQuest” and more closely reflect its vision of equipping 100,000 Christians to share their faith using the evidence for Jesus’ resurrection.Mike is the author, co-author or editor of six (6) books: The Resurrection of Jesus: A New Historiographical Approach (IVP Academic, 2010), Evidence for God: 50 Arguments for Faith from the Bible, History, Philosophy and Science, with co-editor William Dembski (Baker 2010), Paul Meets Muhammad (Baker, 2006) which is a debate on the resurrection of Jesus between the apostle Paul and the prophet Muhammad, the award winning The Case for the Resurrection of Jesus with co-author Gary Habermas (Kregel, 2004) which is a comprehensive self-study course, Cross Examined, a legal novel defending the historicity of Jesus’ resurrection, and Behold, I Stand at the Door and Knock which lays out in a concise manner what to say to Mormons and Jehovah’s Witnesses when they knock on your door.He also contributed a chapter in Buried Hope or Risen Savior: The Search for the Jesus Tomb, Charles L. Quarles, ed. (2008), an entry in The Popular Encyclopedia of Apologetics, Ed Hindson and Ergun Caner, eds. and a chapter in The Big Argument: Twenty-Four Scholars Explore How Science, Archaelogy, and Philosophy Have Proven the Existence of God, John Ashton, Michael Westacott, eds. (Master Books, 2006). He is a featured scholar in Lee Strobel’s new book The Case for the Real Jesus (Zondervan, 2007) and his DVD The Case for Christ (2007). Mike was also one of the authors selected for the Erasing Hate2007 tour (erasinghate).Mike has a Ph.D. in New Testament (University of Pretoria). He completed all requirements “with distinction” and the highest marks. He is a frequent speaker on university campuses, churches, Christian groups, retreats, frequently debates, and has appeared as a guest on dozens of radio and television programs. He is a member of the Evangelical Philosophical Society, the Institute for Biblical Research, and the Society of Biblical Literature. Mike is associate professor in theology at Houston Baptist University and the president of Risen Jesus, Inc.